The Western Australia Port Operations Taskforce is again this year reminding us all of the importance of early ordering and planning to avoid the stress of the peak season. 2012-13 and 2013-14 saw a dramatic reduction in storage and demurrage costs borne by importers. This was due largely to the increased co-operation between importers and supply chain service providers as well as the W.A. Port Operations Taskforce educating the import community of processes that could be put in place to avoid such charges and certain delays. This year we’re here to remind you of steps that you can take this year to avoid any downfalls during the peak season. 1. The biggest, and we believe the most important, is early ordering. Provide a reasonable amount of time for your supplier to manufacture the goods. 2. Ensuring that your supplier is aware of all documentation requirements – and that documentation is required at the earliest possible time. Educate them on the necessary paperwork that is needed to import your goods. If you are unsure of the specific forms that are essential, please contact us directly. 3. Organising telex release for the bill of lading early. Alternatively, if you require an original house bill of lading to be sent to you, ensure that your supplier has the correct address details to courier documents to you within a timely manner. 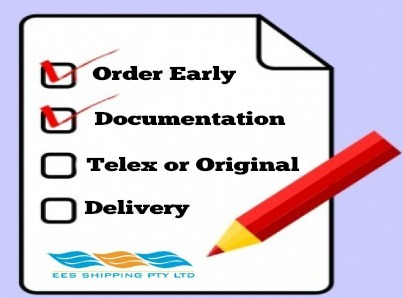 For shipments under Letter of Credit, a statement should be included on your instructions to the bank that the Original documentation must be sent to the bank within 3-7 days of the estimated time of departure.Then arrange for the release of funds prior to the vessel arrival into Australia to obtain the original documentation in time. 4. Knowing where your container is to be delivered. If your container is to be dropped off in an obscure location, a mud map of where you would like the container to go is preferred. Remember, if your warehouse is near breaking point, let us know and we can arrange storage in our brand new facility. 5. Always notify us immediately when your container is empty and ready to be picked up. You can do this via email. Our website has further instructions on what to do when your container is empty. Being organised with the above few steps can ensure that your peak season is smooth sailing. Canberra Airport – an International Air Freight hub?